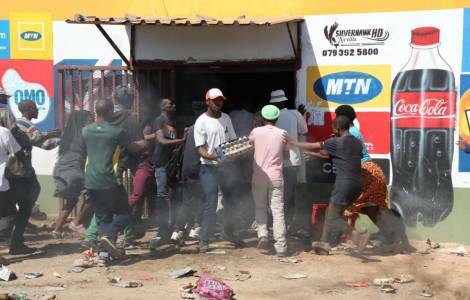 Johannesburg (Agenzia Fides) - "Once again, we had to see media images of well dressed, well fed South Africans looting foreign owned shops, assaulting the owners, threatening them with death and leaving destruction and shattered lives in their wake", said His Exc. Mgr. Buti Joseph Tlhagale, Archbishop of Johannesburg and Chairperson of the Office of Migrants & Refugees, at the Southern African Catholic Bishops’ Conference, (SACBC, includes South Africa, Botswana and Swaziland), in condemnimg strongly, the recent attacks on foreign nationals that occurred recently in Soweto and Zeerust. At least 4 people lost their lives in assaults on shops owned by foreigners after a non-South African shopkeeper had killed a thug during a robbery. Although all the victims are South African, several businesses owned by foreigners have been looted and destroyed. Previously, other unrest had erupted following news reports that the immigrant shopkeepers apparently sold expired or counterfeit products. "In both Zeerust and Soweto, accusations of foreigners selling drugs and selling expired goods should have been brought to law enforcement agencies, instead of local residents taking the law unto themselves", said Mgr. Tlhagagle. The Archbishop said he was taken aback to see the looters loading refrigerators, stoves and other equipment onto trucks, and driving away with it, while the police stood by and did nothing. More than 80% of South Africans claim to be Christians; therefore they are bound to adhere to the most important commandment, “to love their neighbour as they love themselves (Mark 12:31)”, said Archbishop Tlhagale Therefore, he further said that hatred towards anyone, even those of a different nationality, tribe, race, gender or religion, is a direct violation of the command of love of neighbour.